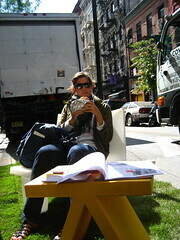 Park(ing) Day is a way to rethink the transportation status quo. The MYD Transportation Committee is hitting the streets on Friday, September 17 (7am to 11 am) to let New Yorkers know about yet another round of transit fare hikes. Actually, we’ll be in the street. That’s because Sept. 17 is Park(ing) Day, when people in cities around the world take over parking spaces as a way to think about how much real estate cities reserve for automobiles, and what could happen if the status quo was rethought. We’ll be there to talk about another status quo that needs to be rethought: the lack of political support for an affordable and effective transit system. MYD will be on Broadway between 93rd and 94th Streets with free coffee and information on what the recently passed service cuts and future fare hikes will mean for New Yorkers — and what New Yorkers should do about it. Stop by, and e-mail Transportation Committee Chair Matt Moran at transport@gomyd.com if you’d like to help out. Restaurant Week and the Christmas tree lighting at Rockefeller Center are supposed to be annual events. Transit fare hikes and service cuts, not so much. Yet here we are again, with public hearings on a more expensive MetroCard beginning this week. The 30-day card will either rise to $104 or become a $99 “unlimited” card that can only be used 90 times per month. Similar options are being considered for other unlimited cards, and LIRR/Metro-North tickets and tolls on MTA bridges and tunnels will also get more expensive. The first public hearing was in Manhattan on Monday; find all the times and locations here. You can also send comments online here (select the category “Public Hearing Comments” from the second drop-down menu). Earlier in the decade, Gov. George Pataki starved the MTA of money for capital projects like track repair, new buses, and the Second Avenue Subway. Instead, he said the agency should borrow money. A lot of it. Debt payments now cost the agency almost $2 billion a year. Last summer, state elected officials actually came together to pass a package which included a payroll tax and MTA governance reforms. They were able to stop a 25% fare hike and huge service cuts. But budget staff seriously overestimated how much the tax would bring in. The resulting shortfall is the main reason the MTA cut service earlier this year. Some state legislatures might say “If at first you don’t succeed at fixing the transit system, try, try again.” Ours voted to cut transit funding by $143 million. Remember New York City’s congestion pricing plan from 2008, the plan to charge cars for entering central Manhattan? The plan to cut down on auto traffic, use the tolls to fund better transit across the city, and reduce greenhouse gases and other pollutants? Remember where it died? So if you aren’t happy about a hundred-dollar MetroCard, let your Assemblymembers and state Senators know, and tell them you know they have the power to do something about it. If you’re free on Friday, hang out with us and learn more!